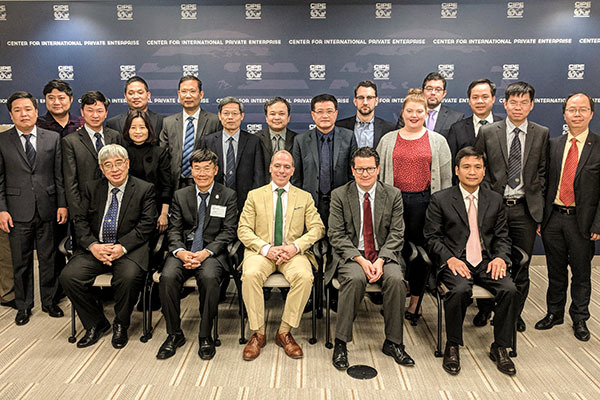 A delegation of Vietnamese government officials has been visiting the United States to gain insights into the US customs bond system as part of a pioneering trade facilitation initiative. The project, which is being led by the Global Alliance for Trade Facilitation (the Alliance), aims to speed up the release of goods at Vietnamese ports by introducing a modern customs bond system, similar to that used in the US. Vietnam will be the first country outside the United States with such an all-encompassing system. Delegates from Vietnam’s customs agencies and a number of other government ministries were hosted by US Customs and Border Protection for a week of knowledge sharing meetings and visits. The delegation met with representatives of US government agencies, insurers and traders who have experience of working with the US system. The trip included a visit to the Port of Baltimore, allowing delegates to see how the US system works in practice for customs officials and importers. The customs bond system allows traders to purchase bonds issued by insurers to guarantee that they will comply with government regulations, pay all applicable duties and taxes, and submit all required permits and certificates. In exchange, customs expedites release of their goods. The release is conditional pending completion of all customs clearance formalities, and if the trader defaults, the bond is called. Tackling Vietnamese customs delays is set to spark major change for the country, making international trade simpler, faster and more cost effective. The new system will help ensure compliance with Vietnam’s regulations and reduce administrative burden on border agencies, while making trade more predictable and efficient for businesses, particularly small and medium-sized enterprises. Ultimately, it will help to make Vietnam more internationally competitive as a trading partner and more attractive to foreign direct investment, strengthening its position as a regional manufacturing powerhouse. The Alliance is a not-for-profit venture which brings together governments and businesses as equal partners to identify trade facilitation issues, such as customs delays and unnecessary red tape at borders, and implement targeted reforms to address them. It was set up to help governments implement the World Trade Organization’s Trade Facilitation Agreement (TFA) and to encourage sustainable development and poverty reduction. Vietnam ratified the TFA in 2015 and has made improving trade facilitation a government priority. Philippe Isler, Director of the Global Alliance for Trade Facilitation, said: “The delegation this week has been a major milestone for the Alliance project in Vietnam, and we are grateful to all those organisations in the public and private sectors that made it possible. The Alliance’s unique approach to trade facilitation is to bring the public and private sector together as equal partners in the reform process and, in particular, leverage the expertise of the private sector. The Alliance hopes to work with the government and private sector to launch a one-year pilot customs bond system for Vietnam later this year.